Explaining why he won't condemn attacks, Abbas says he called on 'everyone' to conduct 'peaceful uprising' - which killed 22 so far. Palestinian Authority (PA) Chairman Mahmoud Abbas was revealed on Tuesday to have made shocking statements two weeks ago, when he said that the murder of dozens of Israelis and the wounding of hundreds others is part of a "peaceful uprising." 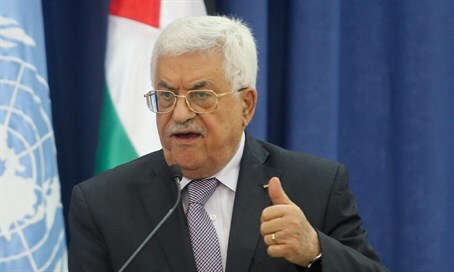 The comments, made on official PA TV on November 16 and revealed by Palestinian Media Watch (PMW) on Tuesday, were meant to explain why Abbas has refused to condemn the murder of any of the 22 Israelis in the current Arab terror wave. At the time of his statement, 14 Israelis had already been murdered and 167 wounded according to official figures. "No one called for this uprising and no one asked for it. It stemmed from the hearts of the young...we said to everyone that we want peaceful popular uprising, and that's what this is. That's what this is. However, the aggression of firing bullets has come from the Israelis," said Abbas. Abbas's blatant justification of the murdering of Israelis and warping reality to present them as the "aggressors" comes even as he attempts to portray himself to the West as being opposed to terrorism. PMW noted the significance of Abbas's comment: "We said to everyone that we want peaceful popular uprising, and that's what this is." Abbas's admission of calling "to everyone" is tantamount to taking responsibility for urging all Palestinian Arabs to engage in terrorist attacks, and indeed the attackers have included young girls and children as young as 11-years-old. The call for a "peaceful" terror wave echoes statements by Abbas in early September, in which he blessed every drop of blood shed in Jerusalem "for Allah" and called to stop "filthy" Jews from visiting the Temple Mount. The PA head's comments about "peaceful" terrorism and his refusal to condemn the murder of Israelis comes even as he has repeatedly condemned terrorism abroad, including a series of condemnations released by the official PA daily Al-Hayat Al-Jadida on November 15, a day before his televised comments. In the press release, he publicly condemned the Islamic State (ISIS) attacks in Paris, ISIS shooting down a Russian airliner in Sinai, an ISIS double suicide bombing in a Hezbollah stronghold in Beirut, and an attack in Jordan's Amman that left five people shot dead. Abbas ended by saying, "we condemn all forms of terror, and always stand against it." But as his comments on official PA TV the following day made clear, he makes a special exception for terror conducted by Palestinian Arabs against Israelis, which is "peaceful." The latest revelation adds to a recent string of declarations by Abbas that challenge his international image as a "peace partner." In late October, Abbas said all of Israel is "the occupation," showing his intentions to conquer the entire state, and last month he revealed for the first time that he rejected the offer of a Palestinian state back in 2008. Abbas in June gave credence to calls by Jewish nationalists arguing that a Palestinian state should be set up in Jordan, when he called Jordanian and Palestinian Arabs "one people living in two states."